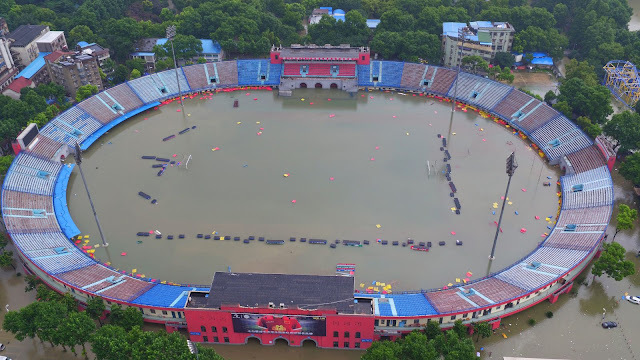 Flood relief and rescue efforts have been stepped up in the Chinese city of Wuhan, which has been hit by severe flooding. Transport links and water and power supplies in the city of 10 million are severely affected. Flooding across central and southern China has killed more than 180 people, state media have reported. The Chinese premier has called upon local authorities across the country to be prepared for further downpours. On Wednesday the Wuhan meteorological office issued a red alert for further rain and flooding. By Thursday, the rain appeared to have eased off, and attention turned to relief and rescue efforts. Chinese media is reporting that more than 600mm (1.9ft) of rain has fallen over the past week in Wuhan, the most ever in the history of the city, which is on the Yangtze River. Roads and metro stations were inundated with water, and trains cancelled. The last leg of the journey home for some people leaving Wuhan train station tonight is on foot, wading through the water. A handful of couples passed me as I stood, almost up to my knees in it, at the traffic lights under the highway overpass by the railway station. A few coaches made it through the temporary pond, as did a few lorries. But there was no rush hour traffic in the worst hit suburbs tonight. There is some respite; the rain has stopped for now. But as I write this there are still cars driving the wrong way down a highway slip road because the rain has blocked their route. On Thursday, Chinese Premier Li Keqiang warned local authorities across China to be prepared for further downpours, and instructed them to ensure measures were in place to avoid potential risks to people's lives. He has been visiting affected areas in Anhui, Hunan and Hubei provinces and was in Wuhan, the capital of Hubei, to oversee relief and rescue operations on Wednesday. Amid the crisis, official figures for the number of dead have fluctuated. On Wednesday state television put the overall toll at about 170.